I plan to show that all triangles are isosceles, or at least all acute triangles are. 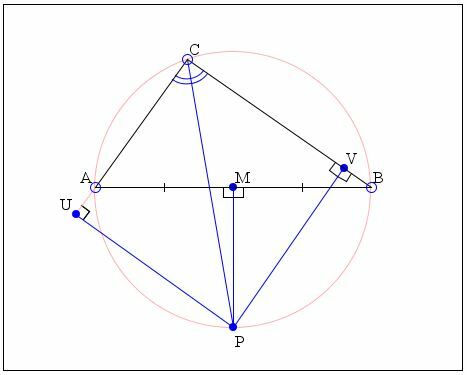 Given such an acute ΔABC, find the intersection P of the bisector of angle C and the perpendicular bisector at the midpoint M of side AB. Drop perpendiculars PU and PV on the sides AC and BC, respectively. AC = AU + CU = BV + CV = BC. Note that we showed that any two sides of a triangle are equal. As a consquence, we may rightly conclude that all three are, meaning that all triangles are equilateral. The problem is with the drawing. The angle bisector of C and the perpendicular bisector of AB always intersect on the circumcircle of ΔABC. This is because the angle bisector from C divides the arc AB opposite C into two equal parts. The same effect is obviously achieved by the perpendicular bisector of AB that passes through the circumcenter. The original diagram is intentionally misleading. C. W. Dodge, Euclidean Geometry and Transformations, Dover, 2004 (reprint of 1972 edition), 7.23.